Monster drinks are energy-enhancing beverages that contain a blend of stimulating herbs and nutrients. There are several different types of Monster drinks, from coffee to carbonated fruit-flavored beverages. Being aware of the side effects of Monster energy drinks can help prevent unnecessary problems while helping you get the most benefit from the product. 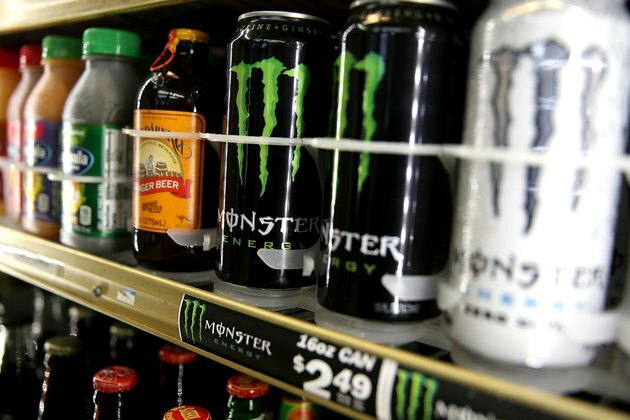 The high caffeine content of Monster energy drinks is responsible for its side effects. Nervousness and jitteriness are common side effects of caffeine. Nervousness may be characterized by excessive sweating, tremor, nausea and racing thoughts. It is often dose-related, with the possibility for anxiety increasing with higher doses. Digestive symptoms are commonplace with many caffeine-containing products. According to the Drugs.com website, nausea is a common side effect of caffeine ingestion. Additional gastrointestinal symptoms that may result from drinking Monster energy drinks include vomiting, frequent defecation, diarrhea and gas. Because caffeine triggers hydrochloric acid production in the stomach, if you have gastroesophageal reflux disease and gastric ulcers you may be at an increased risk for digestive side effects when consuming Monster drinks. Insomnia is an inability to fall or remain asleep. Due to their high caffeine content, Monster energy drinks may interfere with sleep for hours after ingestion. Caffeine is a stimulant that speeds blood flow to organs like the brain, thereby causing feelings of energy and alertness that can prevent sleep. To help avoid insomnia, stop drinking Monster energy drinks and other caffeinated beverages six to seven hours before bedtime. Irritability and other negative mood changes have been observed in caffeine users. According to MedlinePlus.com, caffeine can over-stimulate the nervous system, leading to anxiety and depression when taken in high doses or by people who are sensitive to the substance. If you experience mood swings, irritability or other emotional symptoms after consuming Monster energy drinks, it may be necessary to significantly reduce your caffeine consumption or avoid the substance altogether. Tachycardia—also known as rapid heartbeat—can occur with caffeinated products like Monster energy drinks. While usually associated with higher doses, cardiovascular symptoms can also occur when modest amounts of caffeine are consumed by sensitive individuals. Mixing caffeine with other stimulants like pseudoephedrine or prescription amphetamines increases the risk for cardiovascular side effects. People who are sensitive to caffeine or have a history of heart problems should monitor their daily intake of caffeine from all sources, including Monster drinks.